Engine 910 is a 1979 Mini-Pumper built by Emergency One of Ocala, Florida on a GMC chassis. It was donated to the CPFD via the Crystal Park Metropolitan District in April 2008 by Brian Gardiner, a firefighter with the Southwest 115 Fire Department. It has a gasoline powered engine, carries 1250 feet of 2 1/2” hose, plus 700 ft. of pre-connect 1-3/4 hose. 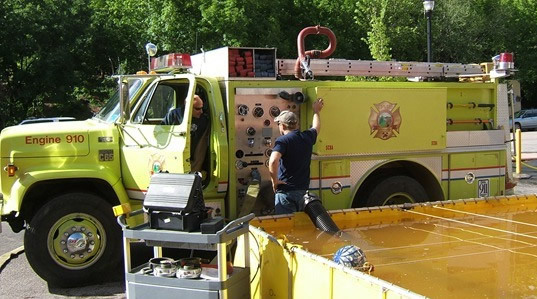 It carries 500 gallons of water and can be connected to hydrants or draft water from adry hydrant or porta-tank, or directly from Tender 960. The pump has a maximum output of 750 gallons per minute. Engine 910 also carries the bulk of the Department’s firefighting and emergency medical equipment and is the CPFD primary response apparatus. Every year it is tested for pump strength and efficiency and always passes with flying colors. Crystal Park Fire Department’s most recent acquisition is Tender 961 which provides invaluable water capability along with Tender 960. CPVFD trains with both water tenders to ensure that we will be ready for the next ISO inspection and a potentially lower ISO rating to help residents save on homeowners insurance. Both tenders provide approximately 4000 gallons of immediate water and fills a regional void of ready water tenders in remote locations. Tender 960 is actually a 2005 construction grade water truck built on a Ford chassis, owned by the Crystal Park Homeowner’s Association. It serves double duty, being used by both the HOA employees and the CPFD. It carries 2000 gallons of water and is used to supply water in case of fire. 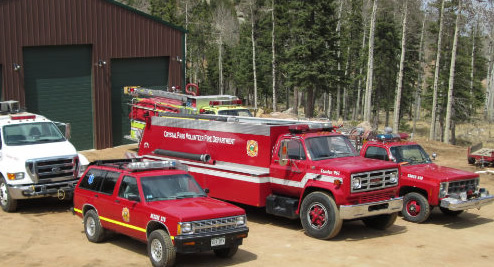 CPFD is looking to replace this asset with a fully compliant NFPA tender that is interoperable with Manitou Springs Fire Department and any other responding fire department. Above, a new dump valve recently installed on Tender 960 reduces the time to dump water into the port-a-tank from 5 minutes to 60 seconds immediately providing Engine 910 and Brush 940/941 with the ability to rapidly draft as needed. Engine 971 was built by Emergency One of Ocala, Florida on a 1979 GMC Sierra Grande 35 chassis. 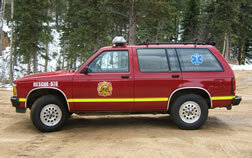 It is a 4-wheel drive mini-pumper with a 350 gpm Hale pump, a 350 gal. tank, booster hose, monitor, pre-connects and drafting ability. It was acquired from the Woodmen Valley Fire Protection District in 2009. This vehicle is in excellent condition, with under 11,000 miles, and enhances the CPFD's ability to respond to wildland fires year round. It will also carry some of the Department's Technical Rescue gear. Victoria West of Falcon, Colorado donated a Chevy S-10 to serve as "Rescue 970" in support of our Emergency Medical Service volunteers. Rescue 970 will also carry high angle rescue equipment in support of the Manitou Springs-Crystal Park High Angle Rescue Team. ATV Trailer – Although the CPFD does not own an ATV, several members of the Department do. This trailer can be pulled to the scene of a lightning strike or small wildland fire in some areas where other Department vehicles may be unable to go. It holds 100 gallons of water at capacity and is operated via a small electric pump to deliver low volume water. Unlike many other communities, Crystal Park does not have water mains, so there are no pressurized fire hydrants. Also, there are only a few natural sources of water and these are likely to be some distance from a fire. Therefore, the Crystal Park Metropolitan District has, over the past several years, purchased 30 fire cisterns that have been buried by the Crystal Park road crew in various locations around the Park. CPFD fire trucks and tender have the ability to draft water from these 1,500 to 1,800 gallon cisterns to replenish the water that they normally carry. The locations of these cisterns are marked with red signs and are numbered. 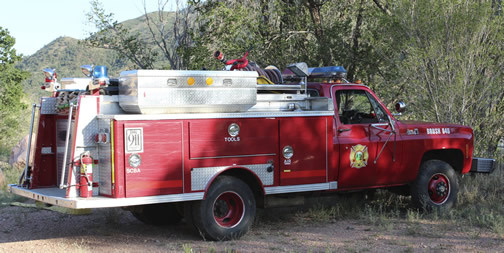 These locations and a map of them have been supplied to the Manitou Springs Fire Department and other fire agencies that may be deployed to Crystal Park in the event of a fire. The CPFD regularly checks these cisterns to make sure they are full of water. CPFD has installed a dry hydrant at the lake in the upper Park. A permanent installation, the dry hydrant allows the tender to pump an endless supply of water from the lake to transport to a fire scene. After dumping the water into the port-a-tank, the tender returns for a fresh supply. 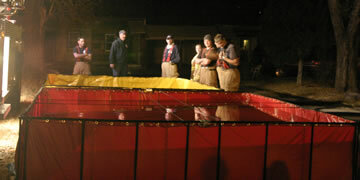 A port-a-tank, which is a large collapsible holding tank with a 2,000-gallon capacity, can be quickly set up near a fire; the tender fills it with water it already carries and then goes to the nearest cistern or to the lake dry hydrant to draft another 1500 gallons and returns to the fire scene. This can be continued indefinitely, allowing the fire engine to continuously direct water onto the fire for as long as necessary.